The MotionNode Bus base unit includes two battery packs and a USB charger. Long battery life and a charge time of only 4 hours allow for constant usage of the wireless sensor network. We use standard USB battery packs. You can charge over USB or use our included wall charger. 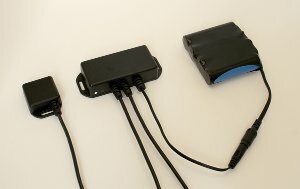 You can also use the wall charger to power the Bus for desktop use. The battery life depends on the number of MotionNode sensors in the network. Refer to our Battery Life document for more information. If you require longer run times on a single charge please contact us. We have larger capacity packs available.